Today’s job market presents challenges that we have not seen since the Great Depression. To acquire a position in today’s job market demands that a person be better prepared to meet a potential employer. In addition, the job seeker must maintain a high level of self-confidence throughout the job-hunting process. Yet, only a small percentage of job seekers take the time to prepare for an interview. Moreover, a job seeker’s confidence level, after multiple rejections, is often more volatile than the stock market. The combination of lack of preparation and a low level of self-confidence is a guaranteed recipe for remaining among the unemployed. Someone who knows something about preparation and building self-confidence is Hall of Fame basketball coach, Bob Knight. In May, Knight gave the commencement address at Trine University in Angola, Indiana. “You can never spend too much time on preparation. The will to prepare is far more important than the will to win,” Coach Knight, who has won more college games than any other basketball coach in the history of the NCAA, told members of the graduating class. Those words had more impact on my ability to begin a career after leaving IU than any class I took while in college. There is no doubt the philosophy of the “will to prepare” helped me earn my first job offer. Along with more than 300 other Indiana University students, I was interviewed by Ortho Pharmaceutical in the fall of 1978. I received the only job offer that Ortho extended. Later on, I was told the reason I was selected was because I had done my homework prior to the interview. You see, not only had I studied the family of Ortho’s products, I knew the company’s competitors. I had spent time talking with pharmacists, physicians and pharmaceutical sales reps about Ortho’s reputation in the industry. When I walked into the interview, I was prepared to sell the company’s product if the interviewer had asked me. The other applicants all wanted a job offer from Ortho; all had the will to win, but none had the will to prepare. Later in my career, when I was vice president of sales for AtriCure Inc., a medical device company, I had the opportunity to hire many sales representatives. More than 80 percent of the representatives I interviewed had not done any preparation for the interview. They couldn’t tell me who our competitors were, or the difference between our products and our competitors’ products. All 80 percent told me they wanted the job. They had the will to win, but they did not have the will to prepare and consequently were not hired. 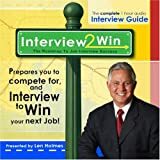 I came to the conclusion that if job seekers would not take the time to prepare for an interview then they would not be the type of individuals who would be successful with our organization. I looked for people who had initiative, and their preparation prior to the interview made that determination for me. The litmus test of the “will to prepare” helped us build one of the strongest and most respected sales forces in medical sales. Statistically, there is currently one job for every five job applicants in the United States. How does a manager decide which one of those five will receive a job offer? I posed that question to three sales managers with years of experience in hiring personnel. Each one said that decision was based on the applicant’s level of preparation and ability to convey self-confidence during the interview. The interesting part of that answer is that preparation and self-confidence feed off each other. That is, the more you prepare for an interview, the more self-confidence you will convey to the person sitting on the other side of the desk. When people ask me how they can build their self-confidence, the answer is easy: Preparation. I hope the seniors at Trine University were paying attention when Coach Knight said: “You can never spend too much time on preparation. The will to prepare is far more important than the will to win.” Every student in every college and university in this country needs to hear and internalize those words before being handed a diploma. If they do, they will have learned one of the most important lessons in how to acquire a job in challenging times.